A year, much like a day, ought to begin on solid footing, don't you think? Even if you don't subscribe to the view that a new year is a clean slate, there's something heartening about getting a new calendar year off to a good start. We can define "good" in various ways, of course; but since this is the season of new gym memberships and diet resolutions, let's play along and go for something healthy. Don't worry, I'm not about to convert this blog to a diet blog. On the contrary, given my new toy, I'll probably have all sorts of new and decadent recipes to share. And what with being on blood-thinning medication for the next several months, I don't exactly have free rein with most of the vegetables that are now in season. But that doesn't mean that we can't find new and interesting (and, above all, delicious) ways to nourish ourselves. I've done a fair bit of nudging and winking recently about whole wheat recipes that I try to pass off as healthy, with varying degrees of success. This recipe falls right into that theme. These pancakes are cooked in butter (or at least I recommend that you cook them that way), and are delicious drizzled with maple syrup, so there's no claiming that they are 100% guilt-free. That said, of all the whole wheat recipes that I've posted, this is perhaps the one with the most bang for its nutritional buck. 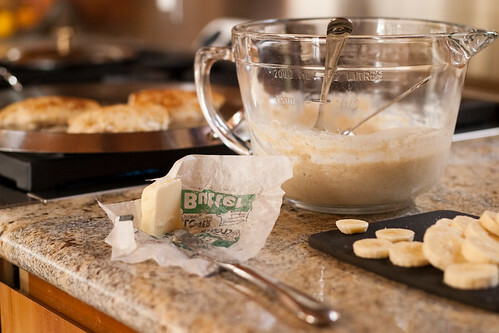 With some of the other recipes, I felt like you couldn't mess too much with the butter or sugar quantities before the intended tasty treat became, well, not as much of a treat. Unlike those recipes, these pancakes don't need a lot of dolling up in order to make you feel like you're starting your morning with something special. They've just a touch of oil and sugar--so little sugar, in fact, that I think you'd hardly miss it if you left it out--but tasting them, you wouldn't know it. And here's another thing you might not guess from tasting these pancakes: they're actually two breakfast foods in one. That's right, these pancakes are made with oatmeal--the better to make your heart jump for joy when you sit down to a plate full of them. But the texture doesn't feel like a bunch of oats, the way oatmeal raisin cookies do. They dissolve (or something?) into the pancake batter, and you're left with a soft and hearty--but not tough or chewy--pancake. The introductory comments on the original recipe mentioned something about these pancakes being rather dense, but I don't think that's the case at all. 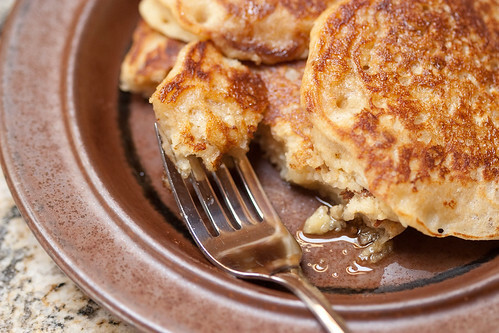 The buttermilk makes them pillowy, lighter than one might expect of whole wheat pancakes. And if you have your heart set on a truly fluffy pancake, you can always separate the eggs, make the batter with the yolks only, and then fold in the beaten whites. These pictures reflect a banana-walnut version of the pancakes, but that's just a variation born of necessity. The recipe was originally written with blueberries in mind, and the pancakes are equally good that way. I imagine they would also be good with no fruit at all, or made plain and topped with fresh raspberries, or apple (or pear, or quince) compote... I'll let your imagination keep that train of thought going. But before I lose you to your reverie, I'd like to wish you all a peaceful and prosperous (and pancake-filled!) new year. Here's to another year of good eating! 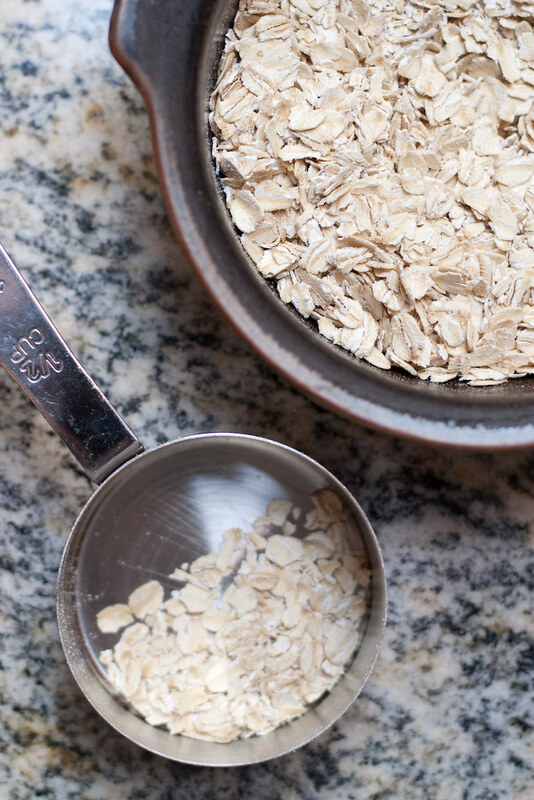 Combine the oats and milk (not the buttermilk) in a bowl and set aside. 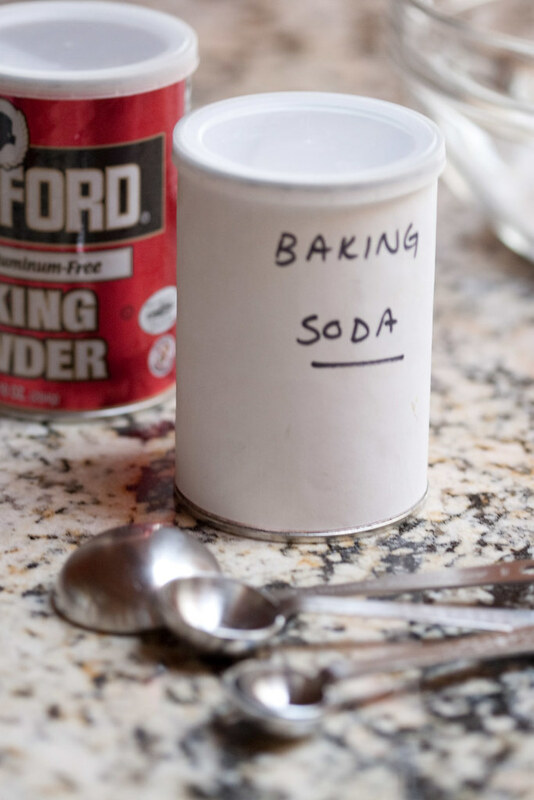 Sift or whisk together the two flours, the baking powder and soda, the sugar (if using), and the salt, and set them aside as well. In a large bowl, whisk together the eggs and buttermilk. Add the vanilla extract and the oil, and whisk to combine. 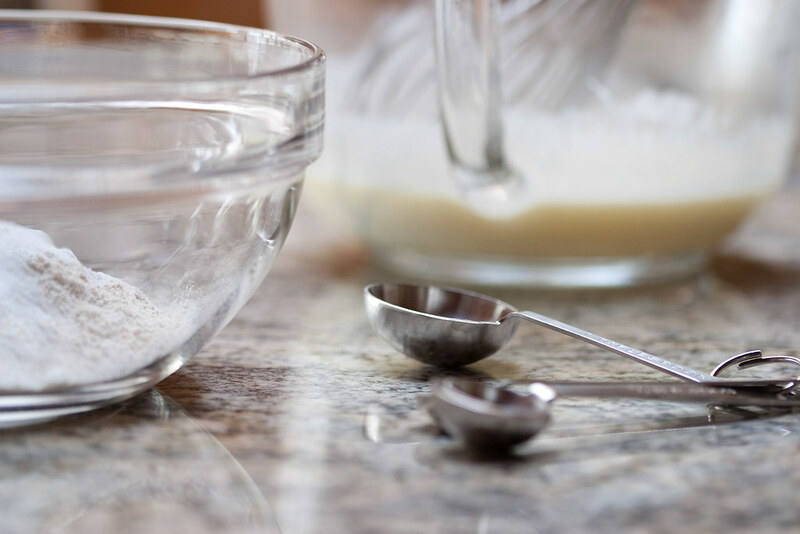 Stir the flour mixture into the buttermilk mixture until just barely combined (a few lumps of flour are fine). Fold the oats mixture and nuts (if using) into the batter. 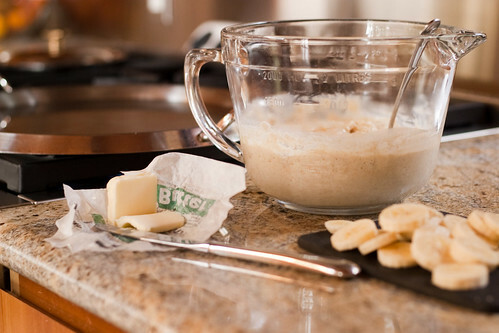 The batter can sit out at room temperature for up to an hour, or you can refrigerate it overnight. Grease the pan with a small pat of butter. When the foam subsides, ladle or scoop the batter in scant 1/4-cupfuls onto the pan, leaving a few inches of spreading room. 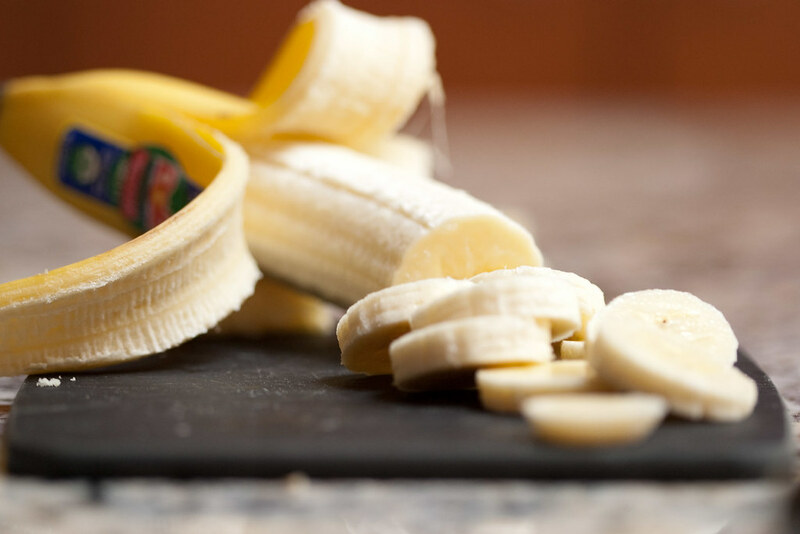 If you are adding fruit, now's the time to drop it onto the individual batter portions. Cook the pancakes until the edges are set and there are several bubbles on the surface of the pancake, a few minutes. Flip them and cook for another minute or so further, until nicely browned. Remove from heat and, if desired, keep warm until serving. Cooled, well wrapped pancakes can be kept in the refrigerator for a few days, or in the freezer for a few months. Rewarm before serving. If you don't have buttermilk, feel free to substitute yogurt or sour cream; in a pinch, you can even use regular milk, but the pancakes might not be as puffy. For those who are watching their blood pressure, I absent-mindedly omitted the salt one morning and didn't notice the difference. Then again, I did cook them in salted butter. I'll admit I have a pretty strong bias that things with healthy ingredients (i.e. whole wheat) just inherently don't taste as good. I'm also a bit ashamed to say I feel the same about vegan and gluten-free things, especially baked goods. My head knows that's not *usually* true, but I haven't really tried too hard to convince myself otherwise. Anyways, my point is that I like the way you're compromising by using some heart-healthy ingredients, but not completely overhauling everything that's good about pancakes, like butter and maple syrup :) Here's to a healthy 2010! omg! your blog is beautiful! i´ve never been here before- and i´m so glad i found you. besos! I have a marvellous ability to rationalize any food that contains oatmeal (or similar). These sound so delicious; they may end up giving my traditional recipe the heave-ho.